If you put a strong oil diffuser in a small room, you might get just the right effect. If you move that diffuser to a bigger room, you might be disappointed to find that it might work as effective as you thought it would be. Depending on the type of diffuser that you have, the size of a room you are putting it in and some other factors, you’ll want to figure out where to place oil diffusers for the best effects. But how can you figure that out? We have seven great tips for you that will help you analyze your home and decide where to place oil diffusers so that you can get the full effect of using essential oils for aromatherapy at home. While any diffuser will disperse the essential oils that you use in it quite liberally, you wouldn’t want to put your diffuser on top of a high bookshelf and expect to get great results even if it is running all day long. Even if the mist comes out of your diffuser very high, you can be sure that it will settle more than it will go up. This means that the most effective level to put your diffuser at is below eye level because, at this point, you’ll be able to smell the oil diffused. Most essential oil diffusers produce mist in what could be called a radial fog, which means that the mist goes both up and out when it is released, surrounding the diffuser in a kind of circle. For this reason, it is most effective to put your diffuser in the middle of the room, such as on a coffee table in your living room. If you put the diffuser in the corner, the scent and expected effects of the diffusion will be stronger in that area, but they may not make it into the entire room. Remember, the particles that the diffuser adds to the air are eventually going to disperse evenly, but you can make it easier on the diffuser by placing it somewhere more accessible to diffuse from. Does a certain area of your house seem to give you a headache because it always smells like the dog or whatever you cooked for dinner the night before? If so, it’s probably a good idea to set your diffuser up somewhere near this area. When the diffuser is running, you’ll find that those headache-inducing smells will quickly be eliminated by the smell of the essential oils that you are diffusing, and you’ll be able to enjoy those areas of your house once again. If you place your diffuser in direct sunlight, you could reduce the effectiveness of the essential oils themselves. Additionally, the sunlight could cause the diffuser to not work as effectively due to excess condensation that would likely form inside of the water reservoir. For this reason, it is important to avoid direct sunlight when choosing a spot for your diffuser. Next, it’s important to avoid fans or any strong drafts. Ideally, your diffuser will never be misting directly on anyone or anything in your home. However, when you set it up near a fan or a very drafty area, the mist could accidentally be propelled directly onto you. While this isn’t inherently dangerous, it’s also not the best way to use a diffuser, so it’s best to avoid that situation. This is less related to how well the diffuser will work, but it is vital that you remember to keep the diffuser away from any areas where it could be easily knocked over while you are moving around your house. In particular, you will want to keep it out of reach of any children who might want to play with it without realizing what they are doing. Not only is it bad if they spill water everywhere, but undiluted essential oils could also somehow spill onto them, and that can be very dangerous. This advice isn’t given to you to scare you, but it is essential that you consider how important it is to keep your diffuser out of reach of pets and kids. Placing a diffuser in your bathroom is one of the best things that you could do to eliminate the musty smell that can otherwise develop in that room. Rather than needing to use synthetic fresheners in your bathroom to make it habitable, you can use the power of a diffuser to bring natural scents like lemon, cedar, and basil into your bathroom. You might even find that you want to spend more time there than you usually would! In the bathroom, plug-in air diffusers are probably the best choice as you would not want to use a cool mist humidifier in an already wet room! Many people buy cool-mist humidifying diffusers for their bedroom, and it’s not hard to understand why! We undoubtedly spend a lot of time in our bedrooms, and that’s one of the places where your mood and health is often affected. If you are sick, having a diffuser in the bedroom can be a big help. Not only will the added humidity help keep your airways hydrated and fresh, but the specific essential oils that you use in the diffuser might help you ease your symptoms. Peppermint, eucalyptus, and chamomile are all great options. If you are having trouble sleeping, adding lavender or chamomile to your diffuser can help you sleep. Just place it near your bed for the best effects on your sleep patterns! As you can see, there are different ways that you can figure out where to place oil diffusers in your home for the best effects. 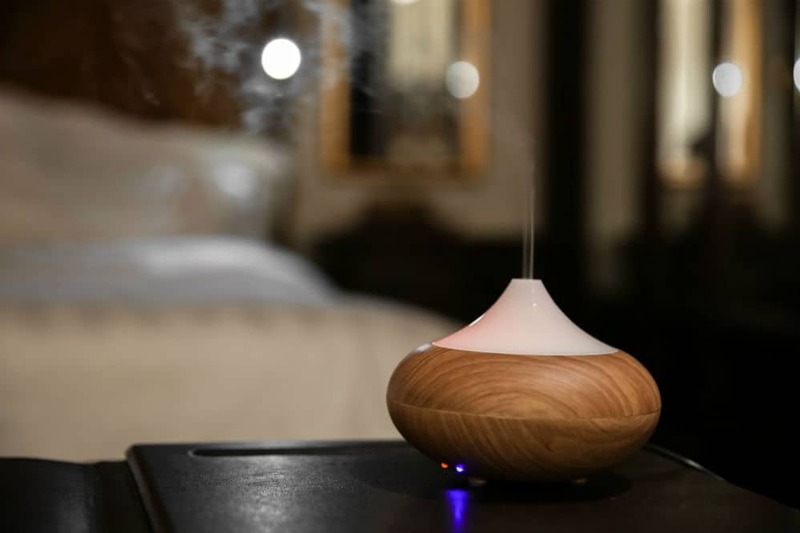 Depending on where you are trying to improve the smell of your home or perhaps to entice another therapeutic effect, you can place diffusers in specific places to ensure you have a fantastic home atmosphere.